Early 2018 marks the completion of Museum Garage in the Miami Design District. Curated by Terence Riley of K/R (Keenen/Riley), the project will feature five dramatically different façades by J.MAYER.H, WORKac, Clavel Arquitectos, Nicolas Buffe and K/R (Keenen/Riley). In Germany several projects currently in development are the office complex Voltaire in Berlin near Alexanderplatz, a 240-unit housing project on Pappelallee in Berlin and a residential high-rise, hotel and parking garage at Grand Central in Duesseldorf. In March we will be part of the German Pavillon at MIPIM in Cannes. And upcoming lectures and exhibitions include Domotex in Hannover, Métropoles Du Sud in Montpellier, India Arch Dialogue 2018 in New Dehli, ETH Zürich. 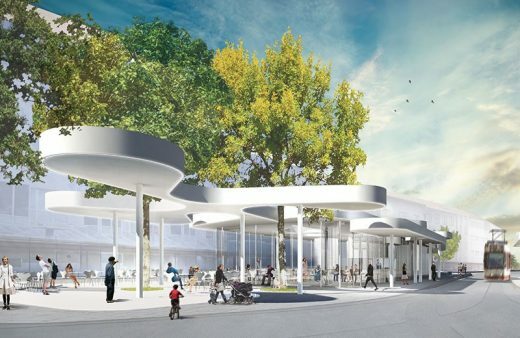 Pavillon am Ring A new tram stop with a café will be built on Friedrichring at the edge of Freiburg’s historical district. The roof’s distinctive shape forms a striking contrast to other structures in the square, creating an attractive space for users of the city’s local transport and other visitors to the city center. FOM Berlin, located in the Tiergarten neighborhood, will be the newest home to Germany’s largest private university network, with 24 campuses around the country and abroad. J. MAYER H. and Philip Ursprung participated in this year’s Chicago Architecture Biennial under the theme “Make New History”. The Biennial is showcasing work from around the world examining the underpinnings of a resurgence in historical interest. It addresses the interaction of architecture and the access to historical source material. The 2017 Chicago Architecture Biennial is open to the public from September 16, 2017, through January 7, 2018 at the Chicago Cultural Center, located in downtown Chicago. 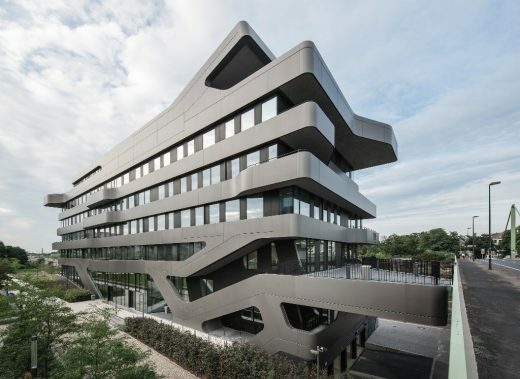 J.MAYER.H is celebrating the completion of the new building of FOM University in Düsseldorf. The 8,000 m² academic building with auditoriums, lecture halls, and seminar rooms will accommodate up to 1,500 students and staff. The non-profit FOM University is Germany’s largest private university. 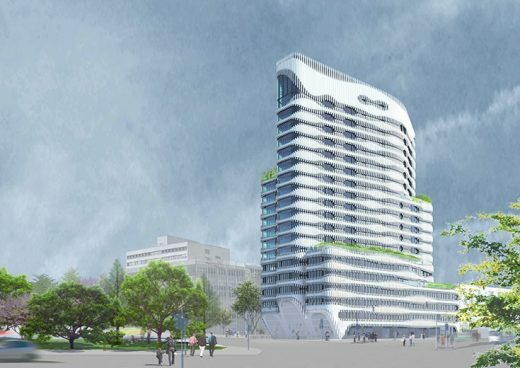 Rhein 740 is a 19 storey mixed medical, commercial, and residential building: the project is now under construction. J.MAYER.H took part this month in the exhibition “Ways of Life” -Experimenta Urbana – part of documenta14 in Kassel, Germany. 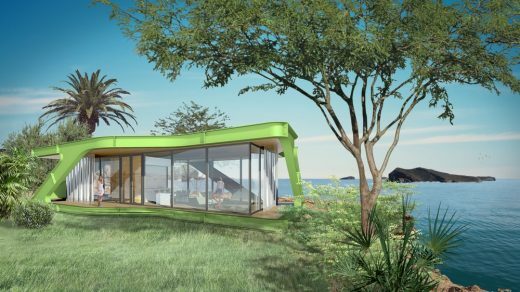 20 emerging offices from around the globe have been asked to develop a prototype dwelling that immerses work in nature while clarifying the relationship between work/ life and the individual / collective. Location: Das Röhm / Tor 2, Weilerstrasse 14 73614 Schorndorf, Germany. J.Mayer.H + Collaborative Architecture are shortlisted for the Iconic Tower in Manila Philippines International competition. 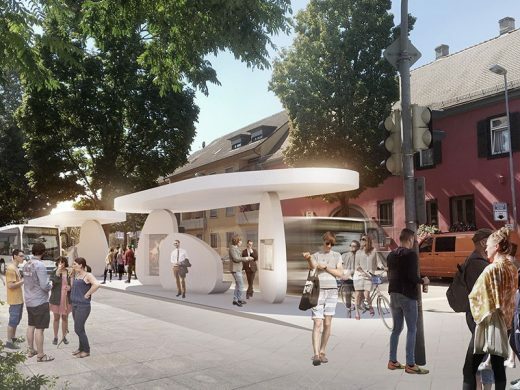 As part of the new transnational tram line crossing the Rhine river from Strasbourg, France into Kehl, Germany, J.MAYER.H designed bus and tram stops at the central square in Kehl as sculptural compositions based on organic shaped discs. The different elements are flexible in incorporating various programmatic needs and evoke images of “Rheinkiesel” or the “Rhine Pebbles”. New Public Infrastructure in Kehl by J. MAYER H.
Diago Home by J. MAYER H.
The Diago Home is a comfortable home with large covered terraces. Floor and ceiling undulate around the enclosed rooms, offering a flexible floor plan with generous outdoor areas. The cantilever roof is supported by diagonal columns around the building’s outline. In 2013, J. MAYER H. designed MobiVersum as a new interaction surface for young visitors to Autostadt Wolfsburg, integrated as part of the overall context of Autostadt “People, Cars, and What Moves Them.” A playful learning landscape was developed for a wide range of experiences in dialog with the exhibition Level Green shown on the floor above. MobiVersum provides an active introduction to the subject of sustainability in all its facets for children of all ages: from the issue of mobility, joint learning and understanding, to courses in cooking. In collaboration with Renate Zimmer (professor, Institut für Sport- und Bewegungswissenschaft at Universiät Osnabrück) a large movement sculpture was created that is unique in terms of its design and the challenges it presents to children’s motor skills. Depending on their individual level of development, children can interact freely with the installation on various levels on their own or with their siblings or parents, engaging with the challenges presented by the sculpture for their motor skills. The shape of the imaginative, playful structures of solid wood are reminiscent of roots and tree trunks under the luscious branches of Level Green. The sculptures, which can be used and entered, structure diversified spatial zones with different thematic emphases and inspire the children’s curiosity to discover and explore. Children as tomorrow’s consumers can thus learn early on the importance of a responsible approach to the world’s resources, for they represent our ecological/economical and social future. 18 Dec 2013 – In January 2014, Andre Santer and Hans Schneider will be joining as partners, bringing their many years of visionary, team-leading experience to help shape and develop J. MAYER H.’s trajectory of success. 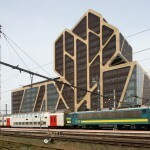 This is the next major building by the german architects J. Mayer H. This imposing design is designed by J. MAYER H. Architects, a2o-architecten and Lensºass architecten. The new house is on a plot of land near Stuttgart, on a hillside with a generous view of the valley. The owners wanted a new home that would bring this view to life even inside of the building. The house is in a residential area with conventional developments, most of which date from the 1960s. The new, 4-person family home is divided into an elevated ground floor with entrance area, utility room and spa, and a second floor with an open, flowing floor plan containing the living, dining and kitchen areas. Le Quartier Central is a lively, newly planned and nearly complete district in the middle of Düsseldorf. 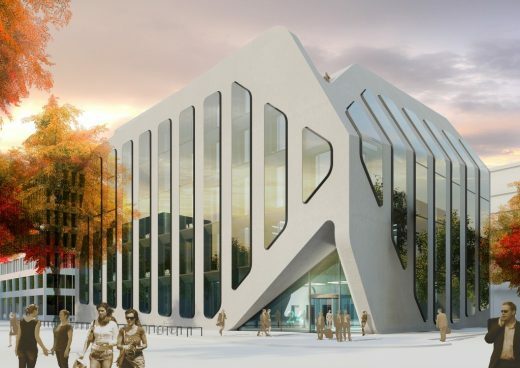 Its creative surrounds are the future home of the new university study center for FOM Hochschule in Düsseldorf. The innovative building with approximately 1,400 student seats features an extraordinary exterior façade with curved cantilevered balconies. The “Schlump ONE” building is located directly at the underground station Schlump in the Eimsbüttel district. The original administration building from the 1950s and 90s was gutted, renovated and expanded, and has now been converted into an office building with four possible rental units per floor. Property development group Euroboden is realizing a unique residential building at Johannisstraße in Mitte, Berlin’s downtown district. J. MAYER H. architects’ design for the building, which will soon neighbour both Museum Island and Friedrichstrasse, reinterprets the classic Berliner residential building with its multi-unit structure and green interior courtyard. In 2009, the head of the Roads Department of Georgia commissioned J. MAYER H. to design a system of 20 rest stops for the new highway, a thoroughfare that will run through Georgia and serve as a connection between the Republic of Azerbaijan and the Republic of Turkey. Two rest stops are now complete, while a third is currently under construction. The new rest stops are located on selected scenic viewpoints along the route and serve as activators for their area and neighbouring cities, including not only nearby a gas stations and supermarket, but also a farmers market and a cultural space for local arts and crafts. The project is situated in the heart of the old town of Mestia, next to the newly built city-hall. Its towerlike shape pays homage to the medieval stone towers which are traditional to Mestia’s mountainside region. The House of Justice serves as a two storey civic centre for the people of Mestia, a village with a strong cultural heritage. image from Jürgen Mayer H.
December 16, 2017 in Architects.